Ryan Carter wanted an excuse to spend more time with his dog cooper, so he started the company Camping With Dogs. 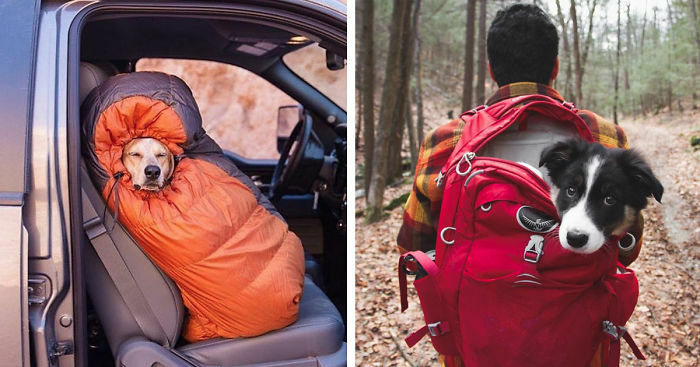 The Nashville, Tennessee entrepreneur's goal is "Inspiring the world to go camping with their dogs!," and his #campingwithdogs Twitter and Instagram have quickly become popular. The Camping With Dogs company successfully promoted and held the first "National Camping With Dogs Day" on September 5th to "celebrate and appreciate our dogs that follow us to the ends of the trail map." Do you love to go camping with your dog? Vote on your favorite picture, or post your own below! Where is this? Looks amazing. A view no words can describe, WOW! Isn't it just so peaceful after we put the human to bed? Would like to know who took this picture! What a shot! That is great! !!! My favorite! Nice snow cave! Did the Husky build it? Looks like a scene from "Out of Africa"...Nice! Love it!!!!!! Just love it!!!!!! Help…. get me out, I haven't quite figure out how to work all those paws yet!! Yes, we should cuddle in the swingy thing more often. I know I love me too! "Do I have something on my face....???" Cute as can be!!!! "OMG! I saw a yeti!" What a great Husky! The best breed yet! I LOVE camping!!! Don't I look great?! And I smell great too right?! Excuse us, we're having a bath here! I'm just a little guy you know! I still say we could be having more fun if she carried all the packs and we chased squirrels! Run like this! We have to run! There's snow and we have to keep warm! I agree, this is a good place to stop. Wow! We started down there? What do you mean I'm the last one to wake up? Oh no, that doesn't look like a very good potty place to me! Man this place smells good! Are you really sure that's an alligator??? This isn't funny at home and it isn't funny out here either hooman! Leave us alone with the swingy thing, and no more pictures, we're in our happy place and we want to be alone. Just throw the stick a few more times before supper? What do you mean it's time to start packing things up and go home? I love my swingy thing here! Hi! We made it to the top first, I'm the welcoming committee, feel free to give me doggie cookies. Welcome!